The Middle Island Life-Saving Station was built in the 1881 following the establishment of the U.S. Life Saving Service in 1871. Various improvements and additions were constructed on site throughout its lifetime, until the station was decommissioned and abandoned in the middle 20th century. 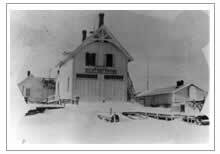 The Middle Island station worked in conjunction with a series of other life-saving stations along the Lake Huron shore, the closest being at Thunder Bay Island 14 miles to the south, and Presque Isle 14 miles to the north. The primary structure at the Middle Island station consisted of a two-story “1879 Parkinson” design with a boathouse, kitchen, dining room, and storage on the main floor, crew quarters on the second floor, and a lookout platform on the roof. The boathouse doors opened to a ramp extending into a sheltered lagoon leading to Lake Huron, and probably contained at least two operational lifeboats. Adjacent structures included a workshop foundation, privy, supply shed, and additional living spaces, with watchtowers, a cistern, and a trash midden (i.e., trash dump) located nearby. Middle Island Lighthouse Station is located in Lake Huron, approximately halfway between Thunder Bay Island and Presque Isle Harbor, Michigan. The island lies about 2 ½ miles offshore of Rockport Harbor. There are seven buildings on the island, including a light tower, Keepers Quarters, an Oil House, Tool Garage, a Fog Horn building and two brick privies which are being restored by Middle Island Lighthouse Keeper's Association. The conical brick tower stands 77 feet tall. The Lighthouse is white with a red band in the middle. Its light is 78 feet above low water and can be seen for 17 miles. As lighthouses go, Middle Island Light is "new," entering service in 1905. However, its important role to mariners traversing the shoals that surround the course between Thunder Bay and Presque Isle on Lake Huron cannot be overstated. The sentinel gets its name because the island is midway between these northern Michigan landmarks. The island had long represented a "triple-edged sword" to mariners. Marking a turning point in the course for vessels making up and down the coast, the island's lee side also represented an excellent harbor of refuge in which to escape Huron's fury. However surrounded with shoals with depths of less than six feet on all but its northeast side, the refuge could be hard to find in dark of night or in the thickest weather. In fact, the area was considered dangerous enough that the Life Saving Service built a station on the island in 1881 to help service ships in distress in the area. Plans and recommendations for the lighthouse began in 1896, but appropriations were slow in coming. Congress finally approved an appropriation in 1902, and construction began on the outbuildings, keeper’s dwelling and finally the tower. Built of unpainted buff brick, the 70-ft. tower stood on a slight rise that provided its fourth order Fresnel lens with a focal plane of 78 feet. It was officially illuminated on June 1, 1905. By 1928, the lens had been upgraded to a third order Fresnel and the fog signal upgraded with the installation of a compressed air-powered diaphone system. When the Coast Guard assumed responsibility in 1939, the tower was painted white with a horizontal black band in the center. Sometime later, the band was painted red, as seen today. Following automation in late 1961and the removal of keepers, vandals took their toll on the tower and outbuildings over the years. 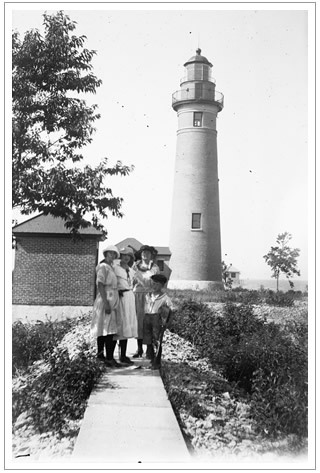 A group of concerned citizens in the Alpena area formed the Middle Island Lighthouse Keepers Association (M.I.L.K.A.) in 1992 with the goal of restoring and preserving the structures for future generations.